do not use any parts, sentences or pictures without written permission of the authors. Ever since sighthounds, greyhounds or Sloughis/Salukis were imported from their countries of origin in Asia and Africa into the western world, numerous myths about their origin have abounded. Clearly, except for the Greyhound and some smooth-coated dogs around the Mediterranean Sea, no other dog of the 420 or so known breeds (of which the AKC recognizes less than half) resembles these hounds. Their swiftness and stamina, their elegant build and their noble attitude all contribute to the fascination these breeds have generated among the dog fanciers in the western world. History shows sighthound-like dogs depicted in ancient images in the countries of origin that resemble in many ways sighthounds still living there today. Consequently, some fanciers assume that indeed Salukis are ancient and may have arisen some 2,000 or more years ago and may be the oldest breed of domesticated dogs. The images found in Egypt and Tepe Gawra suggest that such smooth and coated sighthounds might be even older and date back to the earliest civilizations known to modern man. Among the various sighthounds found throughout Africa and the Middle East, none has stirred more passion than the Sloughi/Saluki/Saluqi group of hounds. 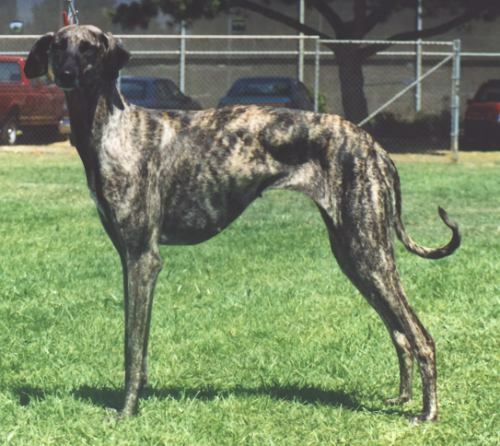 In part, the debate revolves around the name, which describes in Arabic the local sighthound or windhound. Since in a given area only one of those hound types typically exists, there was no need to have more than the generic name that was equally used to describe the specific local variety. Of course, this linguistic confusion of generic and specific, combined with various transliterations of Arabic into European languages and the fact that both the colloquial “Sloughi” and the classical “Saluki” may be used to some extent interchangeably, have confused this matter even more. This confusion is well summarized in Waters’ book on the Saluki ("The Saluki in History, Art and Sport," by Hope and David Waters, David & Charles, 1969), and the reader is referred to this book for more detail. In the modern era, the Sloughi of North Africa (henceforth simply referred to here as Sloughi) was first imported from the French North African colonies to France in the 1800s. These dogs were well known in France since 1850 through the books of General Daumas and also featured at international dog shows. Holland also was a major home of the Sloughi, brought back at the end of the 19th century from Africa by Auguste Le Gras. Feathered sighthounds were portrayed on the European continent earlier than 1700, and were sporadically seen in the UK in the 18th century. It was around the turn of the 20th century that serious breeding started, following the first imports of “Slughi Shami”to England by Lady Florence Amherst (as she then named them) , and later on the feathered sighthounds of Brigadier Lance. These dogs provided the ancestors of the modern Saluki in the West. 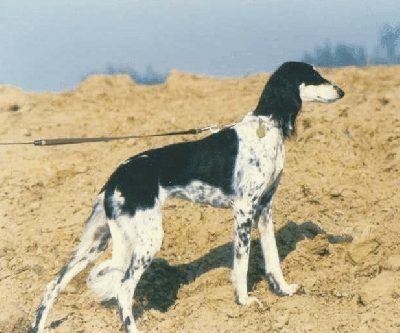 After the First World War ended and with the demise of the Ottoman Empire, both the French and the British had access to the Middle East and brought back many Salukis (named thus in England since 1923). Surprisingly, it appeared that the Saluki came in two varieties, a feathered variety and a smooth variety. Logically, having a sighthound from the Middle East that had features in common with the smooth Sloughi of North Africa and the smooth sighthound-like dogs painted on the murals of ancient Egypt raised a number of questions about the relatedness of these dogs. Fig. 1. The Sloughi and Saluki today form distinct breeds, with some potential overlap of both breeds with each other and with other dog breeds. Fig. 2. The Sloughi/Saluki/Tazi/Afghan/Taigan of today are varieties of one breed, the Saluqi, with little overlap with other dog breeds. Fig. 3. 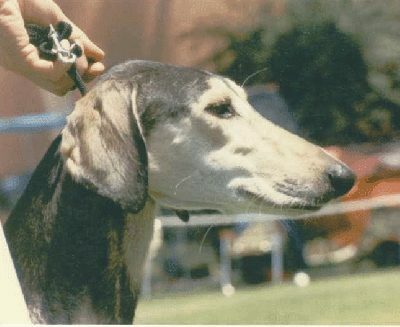 The Sloughi is a variety of the Saluki with some potential overlap with other breeds. Numerous arguments have been raised over the years by proponents and opponents of each of these three hypotheses. With the recent completion of a large analysis of the mitochondrial DNA of 654 dogs of some 124 known breeds, as well as other indigenous dog and wolf populations, the implications of these opinions can for the first time be tested. The samples processed included 8 Sloughis, 15 Salukis, 6 Taigans, 1 Tazi, 10 Basenjis, and 5 Afghan Hounds. The test consisted of sequencing an approximately 582-base-pair stretch (* SEE FOOTNOTE) of mitochondrial DNA. This genetic material is only inherited through the female lines, as male sperms lose their mitochondria upon entering the female egg. In other words, such a study provides insights exclusively into the female background of a given population, no matter what the male looked like and what his genetic material was. Analyzing the male genetic background of a population requires sequencing of the male-specific y-chromosome that is only inherited from male to male without contribution from the female. Such an analysis is on its way, but data are not yet available (P. Savolainen, personal communication). 1) Are Sloughis and Salukis genetically distinct or not? Genetic distinctness would support the Sloughi hypothesis (Fig. 1), genetic similarity the Saluqi (Fig. 2) or Saluki hypothesis (Fig. 3). 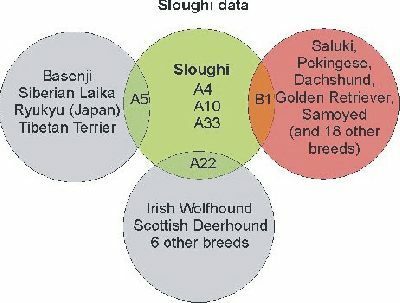 2) Do Sloughi and Saluki share genetic material with other breeds that co-exist in the same geographical area and potentially crossed with them in the distant past? Are these two breeds embedded genetically into their geographical origin while maintaining their unique looks. Logically, the more genetic material is shared between these breeds and nearby totally different looking breeds, the less likely it is that consistent selective breeding took place over centuries. 3) Are there distinct genes in Salukis and Sloughis not shared by other breeds? If the majority or all of the genetic sequences in a given breed are unique, it would indicate a long history of breeding from distinct females and would support the hypothesis that Sloughis and Salukis are distinct breeds. The six sequences found in the eight Sloughis are 50% unique to the Sloughi and not shared by any other breeds analyzed thus far (A4, A10, A33; 2 animals, 2 animals and 1 animal respectively). Of the three sequences shared with other breeds, one is shared with another African breed, the Basenji (A5, 1 animal) but also with three breeds from Japan, Tibet and Siberia. Another sequence is shared with eight other breeds (A22, 1 animal): Boxer, English Setter, Irish Wolfhound, Nguni and Sica (Africa), Scottish Deerhound, Saint Bernhard, and Tibetan Terrier. The last sequence (B1, 1 animal) belongs to a different sequence group and is the only one shared with the Saluki, but also with 23 other known breeds, as well as a large group of dogs from China and Indonesia. Among the breeds are the Dachshund, Doberman Pinscher, Finnish Spitz, Pekingese, Golden Retriever, Samoyed and Shiba (Fig. 4). These sequences are provided by Sloughis that maternally originated, recently or in the past, in North Africa, and of which some represent several well established European and American lines. Dr. Savolainen and colleagues calculated that a single base substitution *(foot note) reflects a mutation rate of about 26,000+-8,000 years. The three unique sequences found in Sloughis are one or more substitutions removed from other breeds. This suggests that the descendants of these three lines may have stayed in North Africa for several thousand years. This suggestion is supported by the sequences shared with the Basenji, the Nguni and the Sica, African breeds that are now found only south of the Saharan desert. At the same time the geographical range of the other breeds who share this sequence (A5) suggests that it might be very old and thus widespread across Eurasia and Africa. The two other shared sequences suggest different things. The A 22 sequence could be related to the invasion of North Africa by Germanic tribes in 5th-6th century or could simply reflect the fairly widespread distribution across Europe, Africa and Asia of this sequence and might not be related to any specific historic event. The B1 sequence shared with the Saluki does not necessarily reflect the invasion of North Africa by the Arabs and their hounds in the 7th century, but could be related to events long lost in the past, as it is shared with other widely distributed breeds of dogs. Unfortunately this study cannot tell us the following: was the maternal line a Sloughi or were the mitochondria contributed by the other breeds, perhaps now extinct? Nor can we know the timing of these events. These results strongly support the idea of geographic isolation with some incorporation of three widely dispersed female sequences for the Sloughi. The unique sequences strongly support the notion that the Sloughi is a genetically unique population of sighthounds and the sequences shared with the Basenji, Sica and Nguni indicate that this breed is, on the maternal side, embedded in Africa, possibly for thousands of years. The eight sequences found in the 16 Salukis are 25% unique to the Saluki and not shared by other breeds analyzed thus far (A43, B15, 1 animal each). Six sequences are shared with other breeds (Fig. 5). For example, A9 (1 animal) is shared only with the Basenji, A26 (2 animals) only with the Wirehaired Fox Terrier of Britain, and A15 (1 animal) is shared with the Korean Jindo and Akbash from Turkey. The three sequences shared with numerous other breeds constitute about 37.5 %. B2 (7 animals), is shared with the Afghan, the Akbash, the Canaan Dog, the Taigan and the Tazi from Kazakstan. B1 (2 animals) is the only one shared with the Sloughi, but it is also shared with 23 other known breeds as well as a large number of dogs from China and Indonesia. A11 (1 animal) is shared with over 35 breeds (Akbash, Akita, Basset Griffon, Borzoi, Canaan Dog, Chow-Chow, Fox Terrier, Siberian Husky, Jindo, Kangai, Pekingese, Rottweiler, Taigan, Thai Ridgeback, Whippet, and several dogs from China). All sequences were derived from Salukis out of the Middle East or bred in Europe and America. These results show that the genetic background of the Saluki is one of the most complex of all breeds in this study. Clearly, the Saluki is not a distinct population derived from a single “Saluki-Eve”. 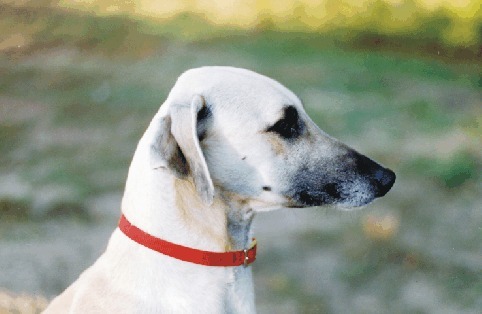 Local Middle Eastern breeds such as Akbash and Canaan Dog appear several times among the Saluki’s related breeds. Whether this is because of incorporation of Saluki-like dogs into these breeds or vice versa remains unclear. 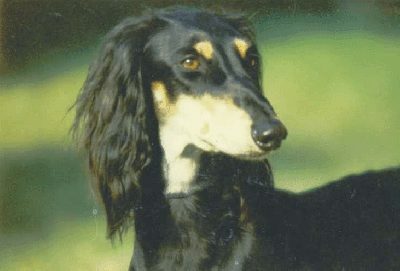 The Saluki shares sequences also with the Afghan, the Taigan, the Tazi and the Borzoi. Since these sequences are also shared by other, non-sighthound breeds, it is difficult to understand the direction of breeding: a sighthound female crossed with those other breeds or a female of those other breeds crossed with a sighthound male. If such crosses happened, they may have been several thousand years ago, as the timeline of these events can not be resolved with this study. The Afghan and Taigan share a sequence unique to both, suggesting some, possibly ancient, relationship, in addition to sequences shared with several other breeds. This study indicates that the Saluki is a local Middle Eastern breed which has been expanded genetically by incorporation of three minor and three major maternal lines shared with few or with many other breeds. A single sequence is shared with the Sloughi, but is also shared with 23 other breeds and a large group of indigenous dogs from China and Indonesia. Therefore, this single shared sequence does not prove an affinity of maternal lines specific to the Sloughi. This contrasts with the more profoundly shared maternal lines of the modern-day Saluki with local Middle Eastern dogs such as Akbash and Canaan Dogs, but also other Eastern sighthounds. The Saluki and Sloughi compared. These results reveal that the Sloughi breed is not integrated in the Saluki’s gene pool, therefore cannot be derived from the Middle Eastern Hounds brought by the Arabs when they invaded North Africa some 1300 years ago. If this happened, it was of such a minor scale that it had virtually no impact on the maternal lines of the Sloughis of this study. In fact, the three distinct maternal lines of the Sloughi suggest that those maternal lines might have been geographically isolated in Africa for several thousand years. If combined with the shared sequence with the Basenji and other African breeds, up to 67% of the female population of the Sloughi might have been in North Africa for a very long time. The results for the Saluki indicate that the breed derives up to 62.5% from possibly local females, which, however, may be common to other local dogs such as Akbash and Canaan Dog. The number of sequences shared by Saluki and Akbash is larger than those shared with any of the geographically nearby sighthounds, including the Sloughi. These results do not support the idea that the Saluki of today has been “purebred” over the last several thousand years and thus might be the oldest purebred dog breed, except if we assume that such integration happened long ago. 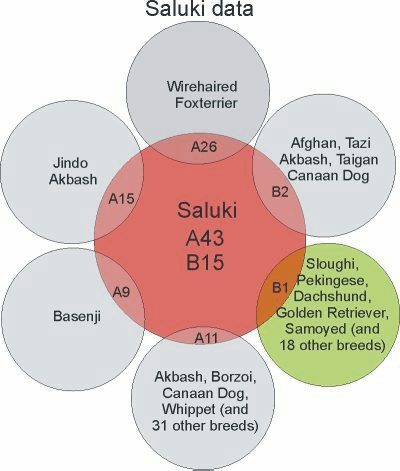 The fact that non-sighthound breeds such as Akbash and Canaan dog share more maternal lines with Salukis than Salukis share with other sighthounds does not provide support for the Saluqi hypothesis. To conclude, these results support the idea that the Sloughi and Saluki of today are distinct breeds with genetic ties to each other that are no more profound than those of either to many other breeds. We hope that this essay will provide for a more rational basis of future discussions. We deliberately refrained from quoting sources for the various ideas in order to allow everyone the opportunity to reconsider those ideas in the light of these genetic results. It needs to be stressed, however, that these conclusions are based on a limited sample size and might undergo some revision once more samples are included. Nevertheless, the genetic data presented here for the first time support the notion previously espoused by F. Amherst and others that these sighthound breeds are distinct. We propose that these breeds should remain as separate breeds until full resolution of their genetic background is completed. A more complete resolution of all the questions raised here will have to wait until the paternal side is known through analysis of the male Y chromosome. Finally, correlating the genetic differences described here to differences in phenotype will only be possible after the dog genome * (footnote) is completed and the relationship of various genes to phenotype have been clarified, research that will require many more years. We thank Dr. P. Savolainen for improving an earlier version of this manuscript. All genetic information is built of DNA (Deoxyribonucleic acid), a giant double helical molecule that consists of four distinct units, called bases, arranged in two parallel strands. These bases are A, T, C, G (Adenine, Thymine, Cytosine, Guanine) A interacts with T, C interacts with G. These interactions form bridges that hold the double stranded DNA together in a full mirror complement of each other. In essence, the DNA is a biological digital storage system that has four signals (the four bases) to code for proteins. The genetic information (DNA) of all mammals is stored predominantly in the nucleus of each cell. In addition, a small fraction of DNA is also found in mitochondria, the power plants of each cell. This mitochondrial DNA (mtDNA) is only inherited from the female to her offspring. No male mtDNA contributes to the next generation. Therefore each male is a dead end with respect to inheritance of mtDNA information. Analyzing the sequence of mtDNA provides thus exclusive information only about the mother’s side of a given dog. Only information about the mother, grandmother, great grandmother etc of a dog will be revealed. Since mtDNA, like any other DNA, encodes information in the arrangement of the four bases, one can compare the arrangements of these four bases to study similarities of animals that result from common inheritance. Thus, sequencing a stretch or segment of the mtDNA will provide genetic information about the inherited relatedness of dogs. Such an analysis would be comparable to ordering all of the letters on this page into a single line without any interruptions and comparing this with files similarly obtained of pages from other books. Logically, only faithful copies of the page would show a high resemblance in the sequence of letters over such a long stretch. Altering the information encoded in the orderly arrangement of bases on the DNA requires altering the sequence of bases. Such an alteration is called a mutation. Such mutations can do a number of things. In many cases, mutations change a single base. Thus, instead of an A it will substitute that for a G, for example. Such base alteration rates typically range in the order of several hundreds or thousands of years, depending on the sequence in question. The genome is all the inherited information or DNA carried from one generation to the next in a given being. The genome of four mammals has thus far been sequenced, humans, mice, rats and dogs. A comparison revealed that dogs and humans share approximately 90% of their genes.